Indicated for the treatment of diabetes mellitus of the maturity onset type, which cannot be controlled by diet alone. 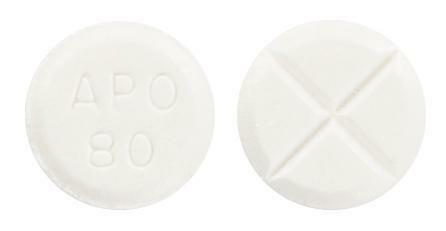 WHITE, ROUND FLAT-SIDED TABLETS WITH BEVELLED EDGES, ENGRAVED 'APO' OVER '80' ON ONE SIDE, CROSS-SCORED ON THE OTHER SIDE. Take without regard to meals. A consistent diet is recommended to reduce the risk of hypoglycemia.